Now more than ever, companies big and small are participating in corporate social responsibility (CSR) programs and aligning their businesses with a dedication to giving back. About a decade or two ago, however, you really only heard of a few Fortune 500 companies dedicating time and resources to CSR, while the majority actively avoided it to prevent any criticism from consumers. To millennials, it can be hard for us to even picture disadvantages to helping our communities since we’ve grown up in a time where we experienced many natural disasters, corporate downfalls, and economic turbulence. We feel dedicated to making the world a little bit better than how we found it. Isn’t that something everyone can agree with? Ushering in a new era of responsibility, companies are approaching CSR programs as a two-way street. They are using their position, resources, and influence to support worthy causes, and finding a bit of a competitive advantage over those who don’t. Corporate social responsibility simply cannot be overlooked as a major component of a good business. The promotional products industry has adopted the philanthropic movement wholeheartedly and we are seeing a number of industry suppliers contributing to various social causes! To quickly and easily connect distributors to suppliers participating in give-back programs, we’ve added a social responsibility program search option in the new SAGE Online 14! 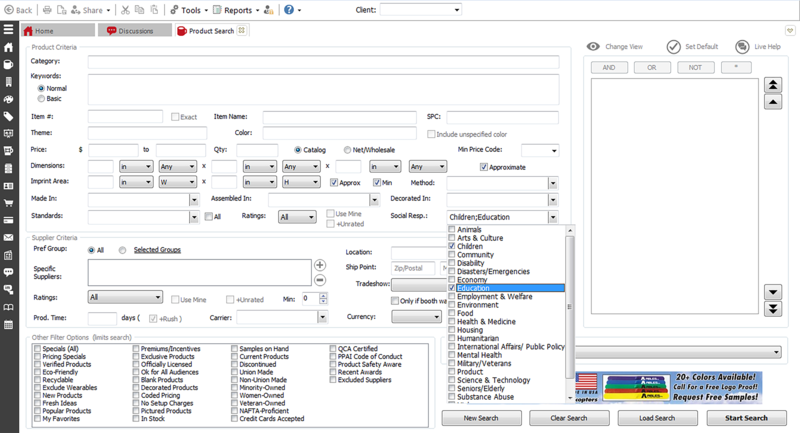 This new search functionality is in the product research dashboard in SAGE Online 14. Distributors can search and/or filter products that are associated with give-back or social responsibility programs by selecting the specific causes that are of interest. From animals, to arts & culture, to children, education, military/veterans, and so many more, distributors can support their clients by selecting products that directly give back to their favorite causes. Distributors can also search for suppliers who have received a social responsibility certification such as B Corp or who have a social responsibility core value or focus under the supplier search area. The PromoCares Project is a 100% volunteer initiative that recognizes companies in the promotional products industry who use their businesses as superpowers – for social good. The PromoCares website features a collection of some incredibly heartwarming stories of social responsibility in action across our industry! Prepare to be inspired. Feeling compelled to start your own CSR program? PPAI has a number of resources on their website to help you get started giving back! In the meantime, you can source plenty of promotional products associated with CSR programs in the new SAGE Online 14!